Welcome back Mad Men. Pleased as punch that from this opening installment there appears to be no significant drop in the quality of writing, acting and directing on this show. Cleverly the British take-over of the Sterling Cooper ad-agency has moved the series on, adding a real vitality as our favourite characters find themselves at loggerheads with their London masters. As the episode opens we learn that a third of the workforce at the agency has been shown the door and further machinations are afoot under the auspices of new recurring character Lane Pryce. Pryce is played to steely perfection by Jared Harris (last seen as a villain in Fringe) and it's highly amusing as he uses mind games to promote both Pete Campbell and Ken Cosgrove to share the position as Head Of Accounts. Vincent Kartheiser gets to demonstrate perfectly what a whiny, spoiled little man Campbell is whilst Aaron Staton remains appealing as the doe eyed, rather dim Cosgrove. It's highly enjoyable to see these two characters suddenly realise that they've got to work together and the sparks begin to fly. Meanwhile, Don Draper having returned from his mid-life crisis in Los Angeles to find his ice queen wife Betty is pregnant, is caught, at the opening of the show, reflecting back on his own birth as he prepares warm milk for the now heavily pregnant wife. It's beautifully done as areas of the Draper house suddenly fill with tableaux of his mother dealing with a still born child (a heavily symbolic pointer to Don's own life and full of sinister wishfulfillment on Don's part perhaps?) and later his own adoption. Draper and art director Salvatore Romano are off on an out of town visit to Baltimore and one of their clients London Fog. 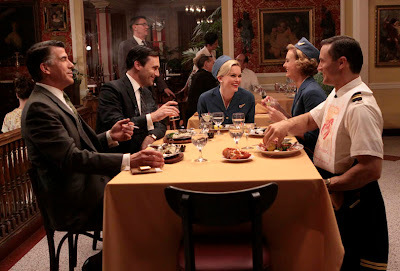 The air stewardess hits on Don and, just when you think he's a reformed man after his shenanigans in Los Angeles and the shock of finding that Betty is pregnant again, he makes a play and he and Sal agree to dinner and drinks with her and the rest of the air crew. It's at this point that writer Matthew Weiner reminds us of Sal's closeted homosexuality. 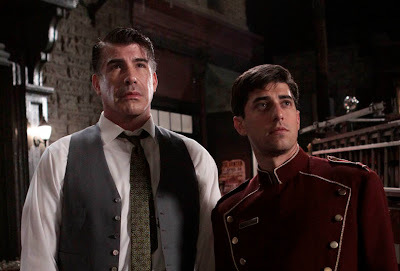 Bryan Batt's always been a great cast member and he was terrific in last year's episodes where Sal developed a crush for Ken so it's great that he gets to shine in this. It's a bit of a shock when, after calling the bellboy to his hotel room to fix the air conditioning, their eyes lock and Sal pounces on what is obviously a rare opportunity for him to get mano-a-mano! And then, ironically, the hotel fire alarm goes off and interrupts play! This has consequences because Don, himself in mid dalliance with the air stewardess, spots the bell boy, semi-clothed, in Sal's room. 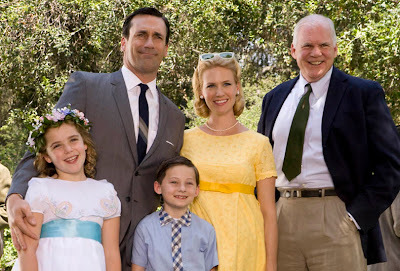 As with much of Mad Men, huge realisations between the characters are handled with heavily symbolic pauses in the narrative, building up the series internal soup of emotions to boiling point. Sal's gay identity stills remains an unspoken revelation but I do hope Weiner returns to this sub-plot because it is fascinating from a historical point of view as well as in the intricate way the series characters are gradually constructed. Superbly written, the episode has an abundance of class lines. When Don finally meets with the representatives of London Fog, a raincoat manufacturer, there is a heated discussion between the father and son owners and Don smooths things over with "There will be fat years and there will be lean years. But it is going to rain." When executive Roger discusses Pryce's scheme to get Pete and Ken to work with each other as joint heads of accounts, "Is Cooper playing God or Darwin?" Don questions. Roger points out it was Pryce's idea. Roger told them it was stupid, he says, "But they don't always get our inflection." The episode ends with yet another symbol. Don's daughter, Sally, finds the air stewardess' pin in his bag and he ceremonially hands it over to her as a gift, with Sally and Betty completely unaware of the pin's real meaning. The narrative completes a circle when Sally asks her parents to tell her the story of when she was born. Terrific opening to a new season. 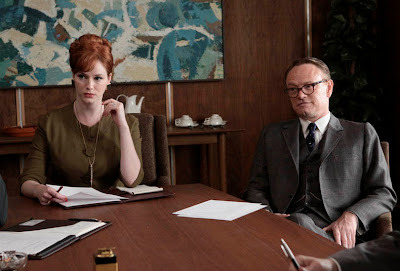 No doubt there will continue to be lots of friction between the workers at Sterling Cooper and their London overlords and the culture clash between what would have been the dominant British culture of the 1960s and the remnants of 1950s Americana is fascinating. A week later and the storylines turn their focus to Peggy Olson. Peggy is an ingenue copy writer and is the series' symbol of female emancipation. She's a woman who doesn't want to get where she wants to be by having to play the usual office sexual politics but many characters bitterly remind her that she has to if she wants to be taken seriously. It's a recurring theme from the last two seasons and it emerges again here. In the opening of the episode, she is cruelly sidelined from the casting of a new ad for the diet drink Patio because she disagrees with the way the ad is being pitched. Elisabeth Moss is just stunning in this episode, beautifully portraying Peggy's continuing frustration that her opinions aren't valued, that she simply isn't feminine enough to warrant having a say about campaigns directed at other women. There is an exchange with Don later in the episode that speaks volumes: "Shouldn't the fantasy be a female one? ", she asks. "Men want her. Women want to be her," Don says of the Ann-Margret Bye Bye Birdie dynamic they're aiming for. "I'm sorry if that makes you uncomfortable." When Peggy argues that the approach is very false, Don says she's not an artist. "You solve problems," he says. It's clear that Peggy is struggling with this dynamic internally and this is beautifully realised when she attempts to do an impression of Ann-Margaret in front of her bedroom mirror as if in some teenage fantasy. If Peggy's storyline is about battling against perceptions of her as a woman then this and the later rather strained scene where she picks a man up in a bar and nervously goes to bed with him show us that she's starting to tentatively push against the preconceived male perceptions of her as a woman. It's quite brave for her to leave the male pick up in the middle of the night with a curt, 'This was fun', when it clearly wasn't that much fun. The other themes in this episode are to do with families. Roger Sterling's divorce and subsequent desire to take his girlfriend Jane to his daughter's wedding is causing immense friction with his ex-wife. I love Roger to bits. He's found a new lease of life with Jane and makes some very pithy remarks to his assembled family members as he's dumped on a table away from the rest of them at the reception. "So you get the in-laws and I get Siberia?" Meanwhile, Betty's ailing father Gene is the subject of a family row. Betty's brother William is all for putting Gene into a home but Betty believes this is the complete antithesis of what families are all about. It's interesting here how the episode shows Don in a positive light, as a peacemaker at both work and home. He rescues an account for Madison Square Garden which he is then told promptly to drop by the London overlords. This again touches on the growing distrust between the old guard at Sterling Cooper and the Brits. "Why the hell did you buy us in the first place?" Don asks Pryce. “I don’t know,” Lane replies. But back home, he realises that to keep Betty happy and to prevent William from dumping Gene in a home, he's going to have to take Gene in. The consequences later become clear when Don and Betty are woken up by Gene in the early hours. Gene, suffering from some variant of Alzheimers, thinks he's back in Prohibition and is frantically throwing alcohol down the drain. I think Gene is going to add a tense dynamic to the Draper household. Another utterly absorbing episode, brilliantly written and performed.